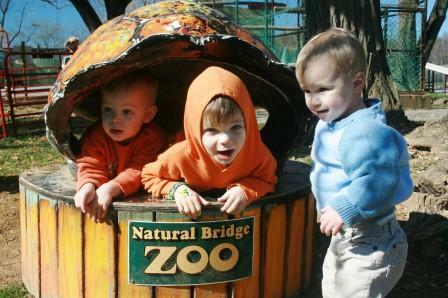 Recently we met up with my brother, sister-in-law and nephew for a day at the Natural Bridge Zoo. I always have mixed feelings about zoos, even though we belong to the local zoo and visit frequently. 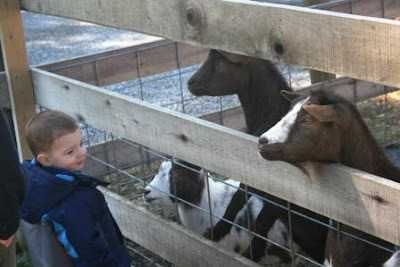 Part of me feels badly for the animals behind bars, but the kids enjoy it and the animals appear to be healthy. At any rate, aside from my guilt we had a pleasant fall day! Cousin Grady checked out the goats. Pierce and Reid enjoyed feeding the goats but Cort wasn't going to go there. Smack in the middle of the zoo...a statue designed to torment small children and leave them with nightmares for months to come? 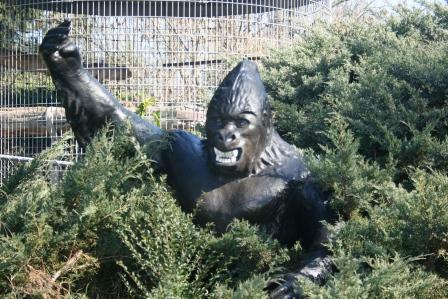 Yes folks, right there in the bushes...statues gone wild. 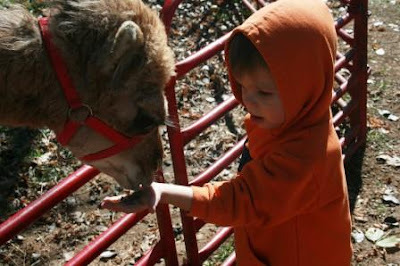 Pierce liked the baby camel. And the turtle shell was a big hit. We discovered with surprise that Cort suffers from ornithophobia. Ornithophobia - an abnormal, irrational fear of birds. Particularly large rhea type birds. Giraffes have got to be one of the prettiest animals in existence. 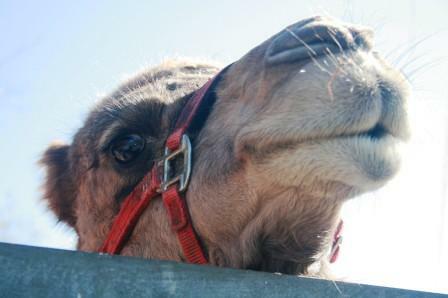 Look at the nice camel. Uh oh. 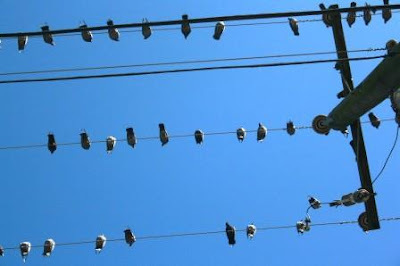 Speaking of ornithophobia - or rather, fear of being pooped on by massive amounts of birds tweeting, "Ready, aim, fire!" Just one last picture, then I'll move! 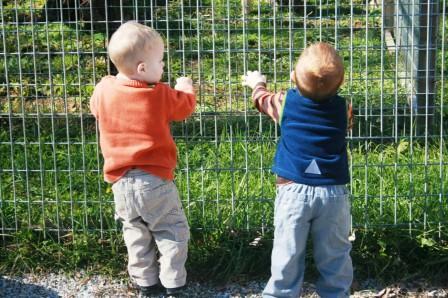 Reid and Grady enjoyed shaking this fence. 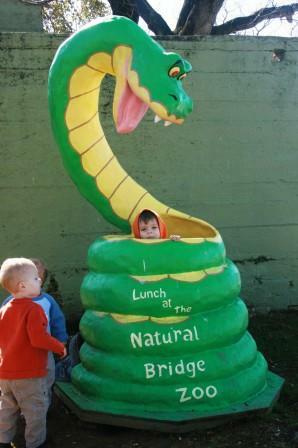 And lastly, how many kids can fit in the belly of a snake? So it turns out four, but no one is fast enough to catch that picture before one takes off! Great pictures! It looks like the boys had a great time. What a great outing! You have such a variety of animals. Love the snake! That looks like a wonderful day! Well,except for the unfortunate bird incidents! I totally get what your saying about enjoying the zoo but feeling a bit bad for the animals as well. Looks like your crew had a good time! The running has been so nice since its cooled off some here!! I actually had to wear my long running leggings yesterday! You are so brave taking your children to the zoo. Congratulations for the award for mom of the year in my book. I love zoos and try to go to each one that I can.. 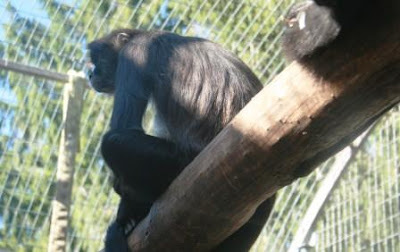 I was in the Bahamas and I visited the zoo there.. STINK-0~!~! IT was really dirty and I felt sorry for the animals because they didn't look like they were being well taken care of like the zoos here in the U.S.A.
Glad you had a great time ~ my favorite animal to go see is the Giraffes..They are so cool~! That "lunch" pic is hilarious! 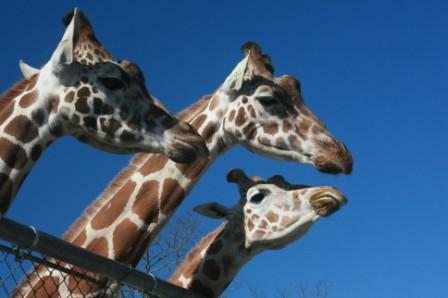 We have a wonderful zoo in Green Bay...we haven't been in over a year though. I guess you do outgrow them a little after a point. I consider zoos a necessary evil, but I rarely do more than donate from afar. I hate watching people try to interact with animals that have no interest in them. We used to go to the Rochester zoo when we lived in New York. Parts of it still had the horrible old fashioned round cages where all the animal could do was lay there. They were working on upgrading it though. We've been to the Seattle zoo a few times-and it's a pretty good one. It looks like you guys had a fun day! I used to take my boys to the zoo when they were little. It's there -- not going away -- enjoy it right? This is a perfect time to go when it's not blazing hot out there. I bet the animals were out more! I love the turtle! I will take two of those gorillas in my yard please to hide amongst the bushes and scare any unwanted critters from the yard, cuz I mean... wouldn't any critter be scared of the king of the jungle? I haven't been to the zoo in years! The Giraffe is my absolute favorite!! And yes...I would Love to run the race WITH you;)) Good luck...can't wait to hear how it goes!! What adorable photos of your 3 Musketeers. It looks like cousin Grady falls right in their age bracket too. You and your DH are doing such a great job of making memories for your little guys. They are blessed to have you both as parents! Such cute pictures! Love the zoo pictures. Your family is adorable. These are great pictures!!! I have actually been in the zoo's gift shop, but not the zoo itself. I need to go. My daughter-in-law doesn't like it, what do you think? Instead, we go to the drive through safari, I can't remember if you have been there or not? You take the boys so many fun places, I'm sure you have. In fact, we are planning on going again tomorrow to show a friend. 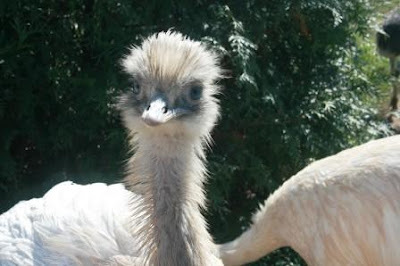 I don't blame the boys, those rheas and ostriches are crazy and scary looking!! That last picture is so cute--those kid move fast! I love the zoo. I could stare at the gorillas and orangutans all day. Though I also feel worse about them having to be locked up. 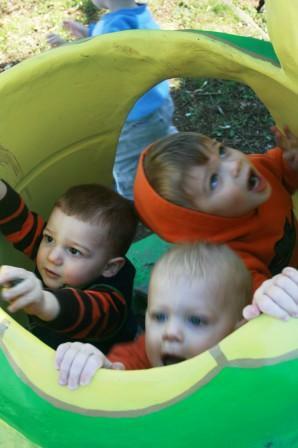 Great set of pictures, Lisa... Looks like the boys had a great time. I like zoos ---and know how much kids love them. I think, for the most part, that the animals are treated fairly well. 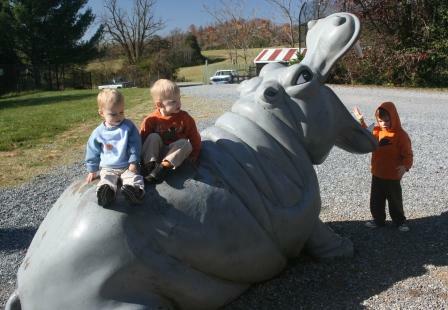 I used to love going to the zoo when the kids were little. I have not been to one in years. Great pictures by the way. I haven't been to the zoo in years. Always a great outing when the boys were younger. I think a well run zoo that has animal enrichment programs in place are ok. 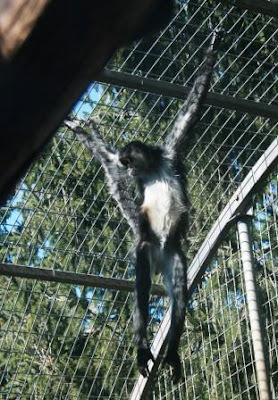 I know our zoo is involved in breeding programs to help preserve threatened species so I think they do a good job. I don't blame that baby, that bird is huge! lol. They are having a ball! Looks like you all had a really great time! I can't wait until my little ones get older so that I can take them to the zoo! I'm sure they'll love it. it sure looked like the boys had a good time. And yes if the animals look healthy it is not too bad, right? I haven't been to a zoo in ages. My children are grown and there are no grandchildren yet. Looks like a fun day. The giraffes are always my favorite. You're right can't hold four down to get a picture all at one time. I do not visit zoos anymore since kids are grown....but these pics are so cute...the nice giraffe, the natural fears...and yes the animals caged is sad but maybe they are used to it? Looks like you all had such a great time. The pictures are so adorable. Your boys are just so photogenic and always have the sweetest smiles!! Beautiful pictures! I thought of you as I did my newest blog... Where you able to participate in the half marathon? I always have mixed feelings about the zoo as well, but my son always seems to enjoy it! Looks like loads of fun! I have mixed feelings about zoos also, but it does give children a chance to learn to appreciate different animals. 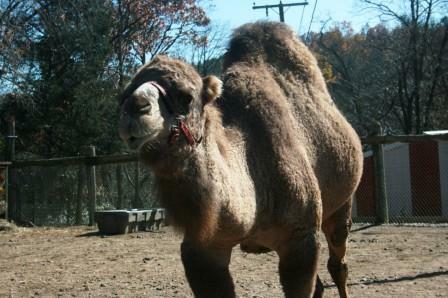 Great zoo pics! Looks like a fun day!